The Sixteenth piece of a small number of pieces of Chin Aaathan, empowered with a Prai Spirit Angelic Deva by Ajarn Taep Pongsawadarn, using his extremely secret Necromantic Formula for the empowerment of Chin Aathan. This Chin Aaathan is from a source which has extremely powerful magic, more powerful than any of the normal kinds of Magical charm. 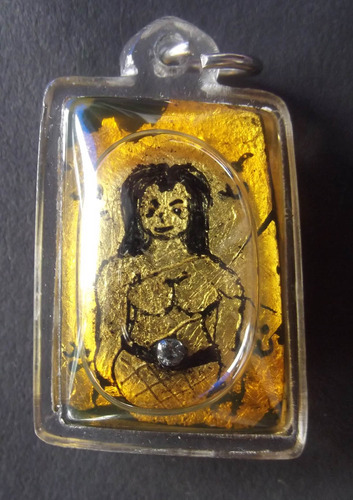 This is the ‘Ongk Kroo’ Masterpiece Version with a real Diamond Inserted into the front of the Nang Fa Amulet. The combination of Prai Magic and Chin Aathan is powerful enough to overcome even the worst karma influencing the wearer, and successfully allow luck and charm to work, by nullifying the Karmic residues which may be blocking any good luck from happening. Chin Aathan is one of the Rarest and most Expensive Magical Substances for Maha Sanaeh and Khaa Khaay magical charms. 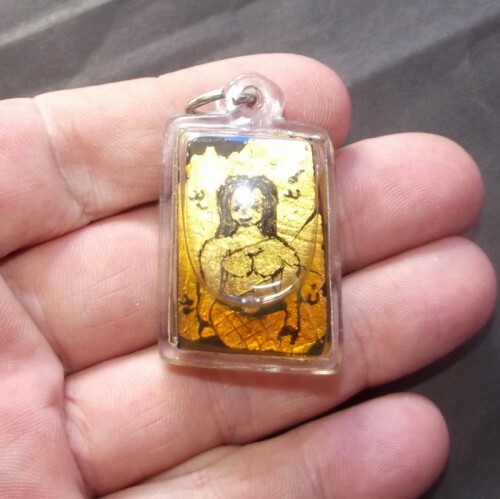 This is the small size Version. Various sizes were made according to the different pieces and how they were carved. Price of each piece is individually calculated according to size. The amulet comes with a certificate signed by Ajarn Taep Pongsawadarn. 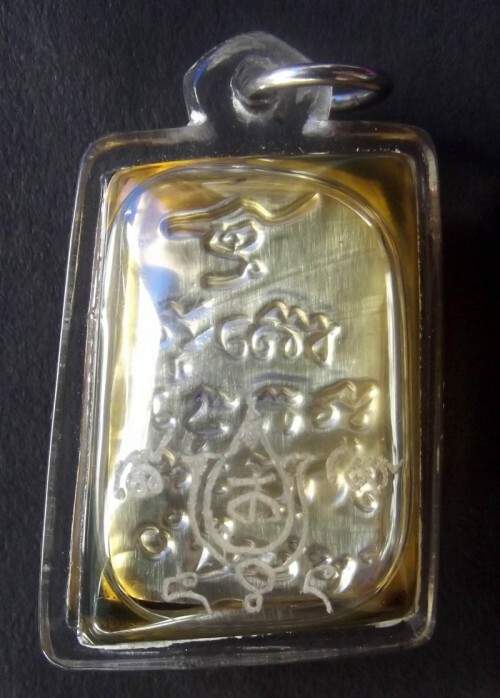 It has a silver Yantra spell on the back with the Hua Jai Mae Nang Fa to invoke and bind the spirit of the Deva whose remains are inside the amulet. You shold take into consideration that because of the Porosity of Bone Substance, the Nam Man Prai immersion Oil may become completely absorbed within the bone carving as Time Passes. Extremely Powerful pure authentic Nam Man Prai Oil charges the Chin Aathan with increased ‘Hian’ magic. A Yantra spell is also engraved on the surface of the casing. 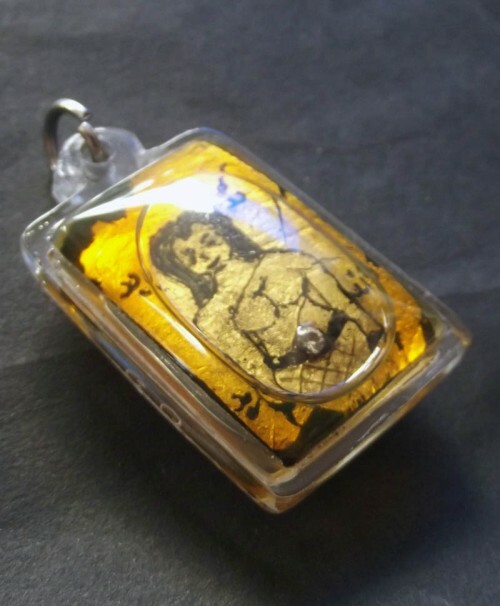 Chin Aathan and Nam Man Prai are perhaps the two most powerful ingredients in Thai Occult Magical practice, therefore making this kind of amulet the surest bet for ensuring successful enterprises, and charming others with ease. The Chin Aathan is decorated with gold leaf on the front face and has the Image of Mae Nang Prai Deva. A Diamond is Inserted into the Navel of the Nang Prai Deva, in this ‘Ongk Kroo’ Masterpiece Version. The Amulet was Empowered over a 4 Years period, recieving over Ten Thousand different Mantras, chanted each ten thousand times for the Invocation of the Mae Prai Nang Fa during this period. Some things we carry over from our Karmic Rebirths, are very hard for the amulets to overwhelm, and magic influences from the past. Some people may have a certain must or aroma for example, that is not consciously noticeable, but that affects customers and social friends to the point where one can not find any popularity at all. In this case, the Chin Aathan is like snake serum, you counter one thing with a little of the same – 1+1 = 0 in this case.